Home » Blog » Safety Tips » Do You Have A Plan? Emergency preparedness is something we all know we need, and yet most people put off until disaster strikes and then it’s too late. Hurricane season will soon be upon us so now is an excellent time to create a plan, and share it with your family. 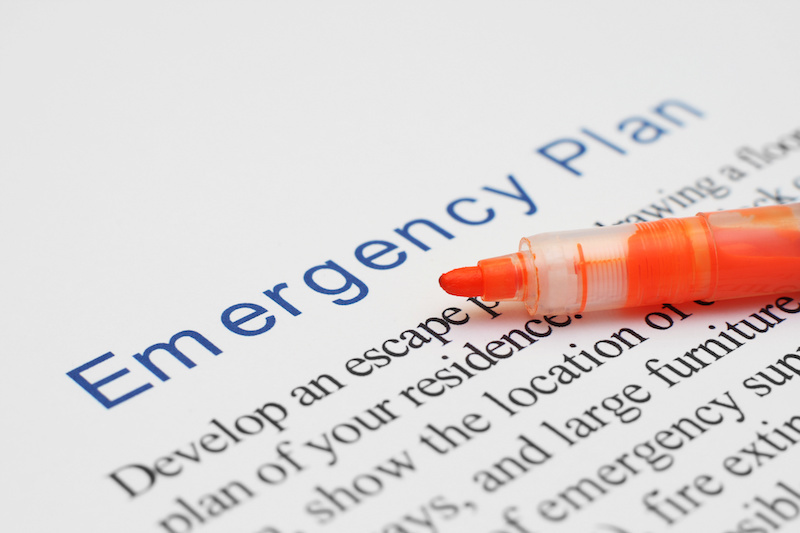 Creating an emergency plan is fairly simple – you don’t need to have a bunker in the woods with years worth of food, but you do need to know what to do in a variety of emergencies. Being prepared reduces anxiety and fear in the face of danger, and that can be lifesaver. Whether you’re creating a plan for a local disaster like a house fire, or something larger like a hurricane or terrorist threat, many of the same steps will be taken. You’ll want to be able to communicate with family and you’ll want a plan if communication isn’t possible. Of course, you’ll need to assess each emergency and the way you respond to each one may be different. A hurricane could require nothing more than boarding up windows and making sure there’s enough clean water to drink. But, it could also mean evacuating the area until it the storm has passed and the region has been declared safe. If you aren’t sure how to create an emergency plan, Ready.gov is a great resource. They have a downloadable PDF to help you create a family plan. In addition to having an emergency plan and sharing it with family members, having a Go Bag on hand can be incredibly helpful. In addition to providing a sense of preparedness, you don’t have to waste time getting these things together in the event of an emergency. Go Bags usually include bare necessities such as matches, simple water purification system, hand cranked radio and flashlight, camp gear for cooking, first aid kit and other necessities. Additionally having a supply of freeze dried food on hand can bring peace of mind. You can create your custom Go Bag using a large duffle bag and filling it with necessary gear. Don’t forget medications. You’re going to have to carry this bag so you’ll want to put only necessities in it to keep it as light as possible. Ready.gov has a handy list of things you need to survive 72 hours after an emergency, but that’s assuming the authorities come to the rescue as they would in following a hurricane or other natural disaster. However, if it’s a manmade disaster, you might need to survive longer on your own in which case you’ll need a more comprehensive bag. Skilledsurvival.com is a great resource for building your Go Bag. They explain what you need, and why you need it. It can be scary to think about disasters and emergencies, but being prepared removes a lot of the worry when disaster strikes. Sharing and preparing children and other family members will go a long way in keeping everyone calm and ready to deal with the disaster at hand.